Uncategorized is the default post category in WordPress, we all know. All posts without mentioning a category will fall under the default taxonomies. 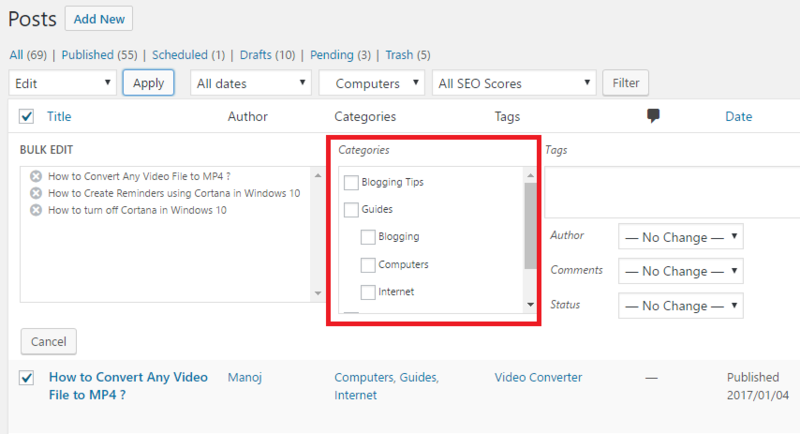 Can you change the default category, rename or delete it in WordPress? Yes, you can. We will show you how. A WordPress post should have a category. When going to the Categories section, you will see delete option along with all taxonomies except Uncategorized. This’s because it is your default category and you can’t remove it anyway. To delete it from your site, you have to change default category first. Visit Settings > Writing, you will see the following screen there. Change the default category to your desired one. Save Changes. Cool. Now go to Posts > Categories, scroll down to the bottom to find Uncategorized. Click on Delete. Done ! If you don’t want to remove, rename it to some other name. For that, choose Uncategorized > Quick Edit. Update category with new name and slug. Save. All posts under Uncategorized will be moved automatically to the new category name. If you would like to include them in some other category, click on the number count of the new category. It diverts you to another screen where all posts under the said taxonomy will be loaded. Select posts according to your criteria, like by tags or by author and choose Edit > Apply. Now you will get an option to assign a new category for the selected posts. Check desired category name and click Update. You have finished the process. Bulk Move is plugin way to migrate from one category to another. It lets you bulk move posts by category, by tag and bulk move category by tag. Install and activate the plugin. In settings panel, select old category/tag from the left side drop down box and a new category in the right side box.